Now, you won’t get that super pretty crisp skin by cooking a turkey in the crockpot and you can’t fit super huge turkey breasts in the crockpot, but it is great for a smaller get togethers OR if you are serving other meats (ham) alongside your turkey. It also makes some of the best turkey for sandwiches and salads as it shreds super well. The past few years the husband and I have always cooked a turkey in the oven and been very traditional about the whole thing, but after one taste of this turkey we are never going back. Crockpot turkey breast OR bust! A few quick “crockpot turkey” notes. Be sure that your turkey is 100% thawed out before putting it in the crockpot. This does take some planning and preparation as a turkey will generally need to sit in the fridge for 1-2 days (a 5-7 pound turkey) to get fully thawed out. Safely thaw your frozen turkey. You can do this one of two ways (1) thaw it in the refrigerator (allow 24 hours in the refrigerator for every 4-5 pounds of turkey); or (2) thaw the turkey in cold water (allow 30 minutes for each pound of turkey). The second option is faster but requires a lot more attention so it’s thawed safely. To keep the turkey thawing safely, keep the turkey in its original wrapping and then put it in a larger plastic bag. Squeeze out any air and seal the bag. Place the sealed bag breast-down into a bucket or sink. Fill the sink or bucket with cold water and place some cans on top of the turkey to keep it submerged. Make sure that the turkey is completely submerged. Change the water every 30 minutes to keep the water very cold. Cook the turkey IMMEDIATELY after thawing. Never thaw a turkey at room temperature. Once the turkey is in the crockpot, have a food thermometer ready to check. A turkey is done when the thickest part of the turkey breast reaches 165 degrees F. I pull my turkey out at 160 degrees as it will cook those extra 5 degrees as it’s sitting. Prepare the gravy. Follow the directions on the included gravy package, if your turkey came with one, or make some from scratch using the notes in the recipe. You can also make a gravy ahead of time by following this recipe. Let the turkey rest for about 10 minutes before carving into it. Tent it with foil to keep it nice and warm! I highly recommend a bone-in turkey breast just because of the flavor you’ll get from it. And speaking of flavor, why do I remove the skin? Well, it’s totally personal preference. You can leave the skin on (and many people swear by the flavor the skin on a turkey brings to the meat). However, it doesn’t crisp up in the slow cooker so I find it a bit unappetizing. But if you’re someone that loves the skin on, you can always leave it on and then BROIL the turkey after its cooked. To do that: preheat your broiler to high. Place the turkey breast in an oven safe dish and broil for 2-6 minutes or until the skin is crispy. Watch CAREFULLY as it can go from perfect to burned in a hurry. 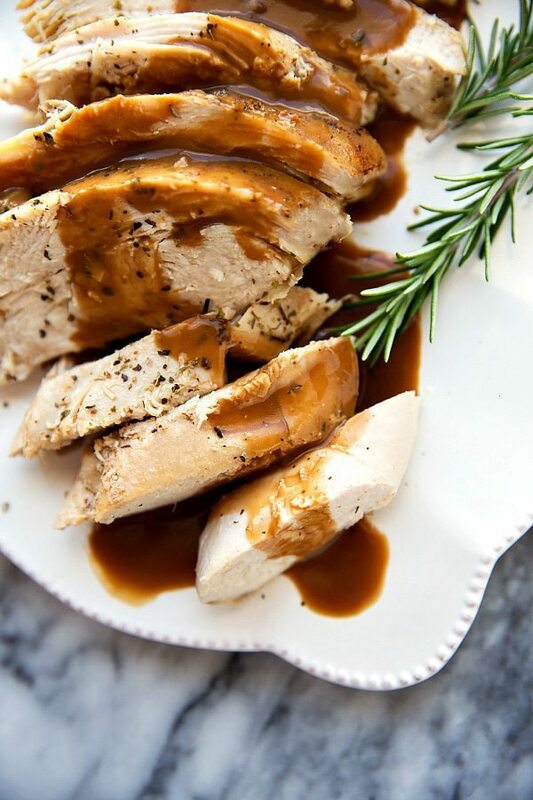 The most tender and deliciously seasoned crockpot turkey breast. 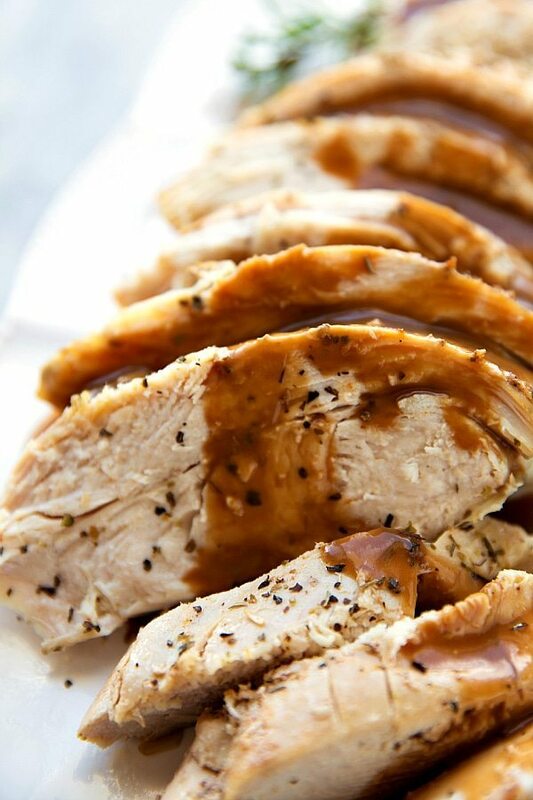 Make sure the turkey breast is completely thawed -- this can take 1-2 days in the fridge so be prepared. It isn't food safe to thaw a turkey in the crockpot. See notes in the post for more details about thawing your turkey breast. Pat the turkey down with paper towels. Spray a large crockpot (I use a 6 quart crockpot) with nonstick spray. Place the celery at the bottom. Cut one yellow onion into large chunks and add it to the bottom. Add the baby carrots. Pour the chicken broth on top. Place the turkey breast, BREAST DOWN on top of the vegetables. Make sure the turkey is ELEVATED on top of the onion/vegetables. Cut the other onion in half and place inside the turkey with 4 tablespoons butter. Stir together all of the seasonings and rub all over the turkey. If leaving the skin on, make sure to rub the seasonings under the skin. Melt the remaining 2 tablespoons of butter and, using a pastry brush, brush it all over the turkey. Cover the crockpot and cook on high for 1 hour and then low for 5-7 hours or until the turkey's internal temperature reaches 165 degrees F.
Remove the turkey from the crockpot and turn so it is breast up. Start by removing the wishbone and then remove all the other bones. Take the large pieces of meat and slice them. TO MAKE GRAVY: Strain everything from the crockpot out into a large bowl (press down the veggies to extract all the flavor/liquid). Measure that liquid (you should have right around 2 cups) and then set aside. In a large saucepan, add 4 tablespoons butter and melt. Whisking constantly, add in 4 tablespoons white flour. Gradually add in the strained liquid from the crockpot, whisking constantly. Add salt, pepper, and any other seasonings needed. Serve warm with the turkey. wow, you butchered that turkey like a badass, I’m impressed. ALso, what a great idea to do it in the crockpot! No dry turkey with the Crockpot! This is great, Chelsea! An easy recipe to make for Thanksgiving. I’ve never made Turkey in my slow cooker. So clever. Thanks for the video! This looks great! I will be trying it on Christmas as long as the turkey breast fits in my crockpot. The breast meat dries out so easily that I think this method will be perfect! I am also thinking of putting a chaffing fish on the table and putting the sliced turkey in it with some gravy so it stays nice and hot. Turkey seems to loose its heat too quickly. I am the type of person that likes food either very hot or very cold—nothing room temperature unless it is supposed to be, of course. Thanks for the info! can you use the turkey breast with ribs. That is all all I can seem to find in the store. The turkey breast has been in the crock pot for two hours… already the house smells heavenly. Will report back after we eat it tonight! Oh I am SO glad to hear that! It’s the best when it makes the whole home smell good 🙂 Hope you loved it! Tried it out this morning! My crockpot must be too small or turkey too large, I couldn’t fit the turkey in with the veggies on the bottom. I’ll just make some carrots for a side. You have gravy on your picture. Did you make gravy with the drippings in the crockpot or just from a mix?? 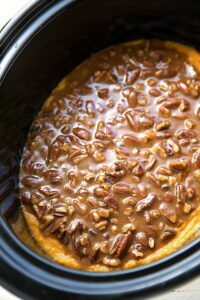 I added in the notes how you can make the gravy from the drippings left in the crockpot 🙂 Hope that helps! So happy to hear that! Thank you Nicole! Do you have any tips on roasting this in the oven instead? I made this last night to this morning. Very easy. Meat was good. Thank you. 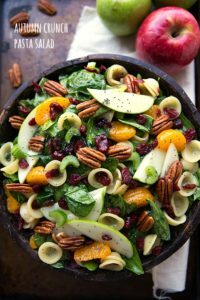 Want to try this….looks great but, can I substitute olive oil for the butter? I’ve never tried olive oil with this turkey recipe, so I really can’t say how it would end up. Wish I could be of more help! I made this recipe using Smart Balance light; we ave to watch our cholesterol intake carefully. The turkey breast was fantastic. It was moist and juicy and the gravy was very good. I have a large slow cooker and will try a small whole turkey (10#) next time. So happy to hear you enjoyed the turkey and the gravy! I love hearing that 🙂 Thanks for the comment Karen! I’m preparing to make this tomorrow. I could not find a single turkey breast that was 5 – 6 pounds, so I got two that were 2.75 pounds. Will two cook thoroughly in my crockpot? I could also split all the remaining ingredients in half and just cook one breast. What would you recommend? I ended up cooking only one 2.75 lb turkey breast. I chopped the rest of the ingredients in half and it worked out fine. The meat was a tad bit dry, but it was in the crockpot around 10 hours on low. Probably a little too long. Next time I will cook it less hours. All in all, the flavor was really good despite the dryness. Thanks for this recipe, I will be trying this again real soon! Thanks so much for coming back and letting me (and others) know! Yeah I’m sure if you cut down that time it would be a lot more moist; I’m glad you enjoyed the flavor though! Hope you completely love it the next time you try it for less time! One other question, can I cook on low for 8-9 hours instead? I will be at work all day. I skimmed the recipe rather quickly before getting the ingredients and prepping. I just now realized that the recipe states to cook on high for one hour before turning to low. Great tip to get crispy skin if leaving it on: put it under the broiler in the oven for a couple minutes!!! Works great when roasting a chicken in the crockpot also!!! I was planning on cooking a boneless turkey breast this year (just 4 of us). Would the cooking time need to be adjusted? Yes it likely will need to be adjusted. I wish I could be of more help, but I’ve never tried a boneless turkey breast in the crockpot so I don’t want to give you an incorrect recommendation. The size is the biggest determining factor of the time in the crockpot. Hi there! I am so GLAD I came across this blog post!! I finally know how I’m going to cook our turkey breast this year! I do have a question, though: I see that you checked the temp after taking the turkey out of the slow cooker. Do you do this with the assumption that the temperature has been reached and you’re measuring just to be on the safe side? What if the temperature is not high enough upon measuring? Do you put the turkey back into the slow cooker? 5-7 hours is a large window and, other than monitoring the temp as it cooks (which I don’t know is an option with slow cookers), I’m unsure of how to know when to stop cooking and take the turkey out! Thanks so much!!! Bought everything BUT it doesn’t fit in my crock pot! ? What temp/time would you recommend for oven baking? Oh no! Would it fit without the veggies at the bottom? If so, you can try and cram the veggies in the side or on top — they don’t have to be at the bottom. Did this last year and doing it again this year! Cooking it in the crockpot breast side down is genius. SO GOOD! Worked like a charm! My boyfriend had doubts, but definitely not anymore. Thanks for the recipe and all of the helpful hints. I am going to try this turkey recipe next week for my family who will be coming in before Christmas. My concern is that my crockpot is a 4 quart. Do you think this will still work? I may use less vegetables so that the turkey will fit. Hmm I’m not sure if it will fit; mine was pretty full at 6 quart. Used this recipe for Christmas dinner. My crock pot was a tad too small for a 5# breast. Made it work. It was incredible! Thanks! Inevitably – when one skims through recipe reviews/comments – very few reviewers have actually made the recipe – but just want to say how delicious it sounds… So if you’re looking for an actual “I made it and it was awesome” review – this is it. 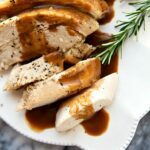 I’ve always made Turkey breast in the crockpot — spares the oven for the other things that have to be baked, and you don’t have to tend to the turkey (no basting, no messing with it). But I needed a reminder on how much broth to add (couldn’t find my usual recipe). I decided just to follow this recipe since it was so simple. Just remember spices can be tweaked so easily. Plus – I had no carrots, and it still came out perfectly. Tip – leave about 1/2″ broth in the bottom of the crockpot after removing the turkey to carve, and to round up the broth for gravy. After slicing – return to crockpot – and drizzle a little broth on top so that it doesn’t dry out while you prepare the rest of the meal. Be sure crockpot is off, though. I leave the skin ON so that I can put butter/spices/garlic cloves in there – but remove it before carving (it’s not edible in my book – there’s no crispy brown skin on crockpot turkey). Cooked for 8 hrs on high… 9th hour on “warm” – and was perfectly cooked. Turkey breast is so easily dried out in the oven – this is truly no-fail. Moist, tasty – and the house smells amazing! Just took it out of the crockpot snuck a piece and so far amazing. Making gravy now I will update once we have our dinner. That was the most amazing, moist turkey breast I have ever eaten. The crockpot makes all the difference it was sooooo good. Just added some salt while it was cooking and all I can say is outstanding will definitely make it again for sure. Thanks for sharing. Loved it – an FYI. I love the crispy skin. You can take the skin when removed prior to putting breast in crock pot & lay it out on a cookie sheet. Brush with oil or rub with butter, lightly season & put under broiler til as crispy as you like. Thank you for sharing the recipe. This could be the first Thanksgiving where the turkey never dries out! I hope you love the turkey!! It’s amazing how moist it is made in the crockpot! I need clarification. The directions say to put the breast in the slow cooker & then rub the spices on but if you are leaving the skin on to rub them on under it. Do you rub the spices on the breast & then turn it upside down in the cooker? probably obvious but just checking. Thanks! Yes rub the spices on the breast first and then place in the slow cooker and rub it over the rest of the turkey 🙂 Enjoy! Will never use this website/blog due to ads!!!! Sorry to see you go Kathy! The ads on the website is how I make an income to provide for my family and to provide all of these free recipes for you. Best of luck! Oh, good grief! 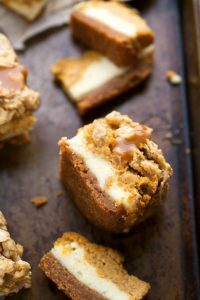 I was able to view all the photographs, watch the video, read through the recipe and comments, and write a review without any interruptions (read: ads. If you do not have anything nice to say, do not say anything at all. And, no, I have not tried the recipe, but I am going too; it looks and sounds so incredibly delicious. Thanks for the inspiration, Chelsea! How long would you cook an eight pound breast on the bone? How much would you adjust the cooking time for a 3lb breast? Could I skip the 1hr on high and just do the 5-7hrs on low, or would I need to pare that part down too? 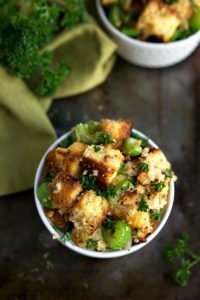 Looking forward to trying this since my tiny family of 3 is staying home this thanksgiving holiday! Looking so forward to using this recipe but I’m going to have to cook it early. Does anybody have reheating tips ?? How long would I do a 3lb boneless breast? Would skipping the 1hr on high and jyst cooking 5hrs on low be ok, or would that still be too long? 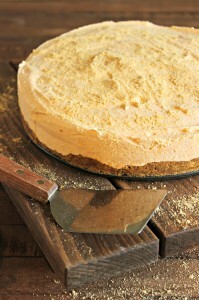 Looking forward to making thks tomorrow! This recipe worked out great. I found it the night before Thanksgiving when an issue with my oven had me looking for alternatives. I didn’t have chicken broth so I just used water, but even with that substitution, it was the best turkey I ever had. One note: It got to temperature after just 4 hours, so I put the crockpot on warm for three hours, and it was still juicy and delicious. The turkey was brined, so that may have helped. Thanks for the great recipe. I don’t think I’ll ever roast turkey breast again. Yay!! So thrilled to hear that! Thanks Kimberly! Can this recipe be done with a whole turkey? I don’t think a whole turkey would fit in a crockpot unfortunately. Looks really good, thank you for sharing ! Will this same recipe work with a chicken too? Just tried it. It was delicious! Made sweet potatoes with walnuts and tossed salad as a side. It was delicious and super moist. My fiancé said it was one of the best meals he’s had in a while and I agree! Fabulous!!!!! I made perfect gravy with this, loved that the turkey was not dry! could you cook the turkey in the crockpot one day & reheat it the next day and what would be the best way to reheat it? I am running out of crockpots. Thanks Julie D.
Hi! Quick question where did you buy your turkey? This recipie is amazing! I have made this turkey several times and my family always loves it! I’m trying it today with a boneless turkey as that was all I could find at the store, it is January after all! Cooking it on low for 8 hours. I will let you know how it turns out. Thank You Chelsea for sharing all your amazing recipes! I appreciate you taking the time to create wonderful foods for us all to enjoy! Have a Great Day! Absolutely delicious! One of the moistest turkeys we’ve ever tasted!